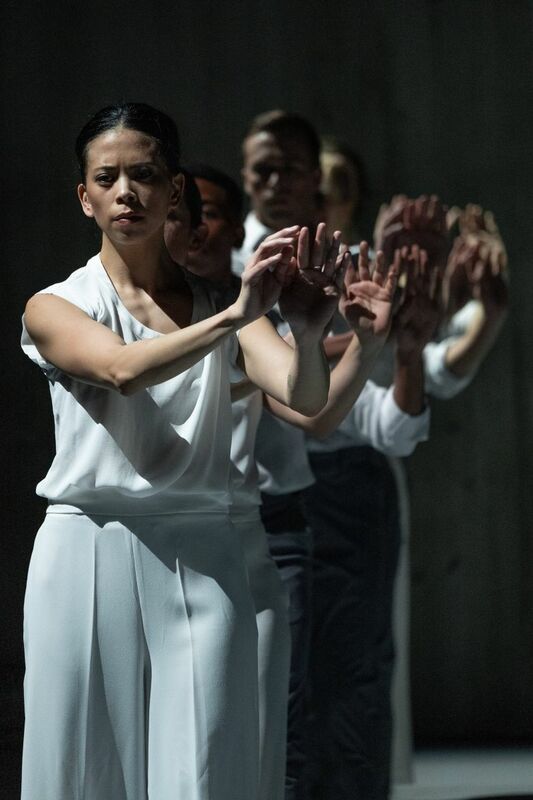 In contemporary dance done well, everything seems to carry meaning and verve, down to the smallest onstage gesture. This quality is on full display in the latest from Seattle's Whim W'Him. "3x3" features fresh new dance concepts from Zoe Scofield, Yin Yue, and Whim W'Him's own Olivier Wevers. “You can bring your drinks inside, and it usually doesn’t start on time.” This is how I described the world of contemporary dance to my ballet buddy on the opening night of Whim W’Him’s new production, “3×3.” I was half-joking, but most jokes contain a truthful core, and that evening, it was this: Everything may be beautiful at the ballet, but contemporary dance brings us down to earth. Lines are broken. The work isn’t (always) representational. And when it’s done well, everything seems to carry meaning and verve, down to the smallest onstage gesture. This is something Whim W’Him typically does well, and “3×3” is no exception. As usual, founder and artistic director Olivier Wevers began the evening — standing, posture perfect, in a cloud of stage smoke — with a short, gracious opening speech, encouraging audience members not just to silence their cellphones “but to actually turn them completely off.” Though I was delighted by this (nothing kills the vibe during live art like a buzzing pocket-computer), I have no idea how many of us actually complied. But there was much more at work in “3×3” than Wevers’ signature charming pleasantries and devotion to total engagement with art. In a field disproportionately crowded with male choreographers (most egregious in ballet, but well-documented elsewhere), it was a treat to see two women choreographers sharing space with Wevers: Zoe Scofield and Yin Yue. All three debuted new work, beginning with Yue’s “The Most Elusive Hold,” her commitment to abstraction right there in the program notes: “There is no traditional narrative such as stories or characters.” Instead, “The Most Elusive Hold” relied on the structured physicality and compulsion-like movements of Whim W’Him’s company dancers, as they traveled across the ragged bones of an unadorned stage. Sections of partnering were confrontational, almost aggressive. 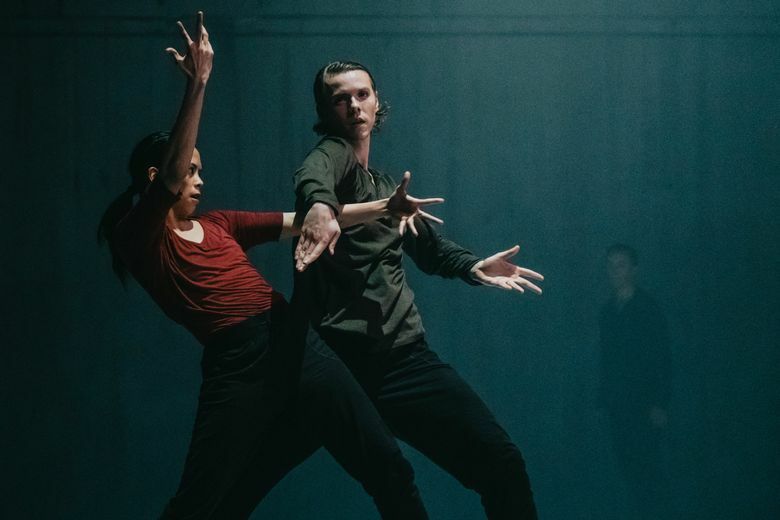 With little to hold onto but the dance itself, “The Most Elusive Hold” is a successfully challenging piece that becomes a meditation on the immediacy of performance as much as anything else. That might not be your thing, but it was a strong place to start, especially since the following performances invited in more narrative. The first of these, Scofield’s “This mountain (announcing your place in the family of things),” takes the parenthetical in its title from “Wild Geese,” a poem by Mary Oliver, who died earlier this month at age 83. “Wild Geese” is a poem about loneliness and belonging — perhaps THE poem about loneliness and belonging — and is a well-chosen signpost for Scofield’s work. Oliver’s work is full of moments of subtle communion and devotional astonishment, and “This mountain” contained both, in evocative moments of accumulation and the possibility of connection. One visual cue that brought the dancers across a stark rectangle of light was especially stunning. 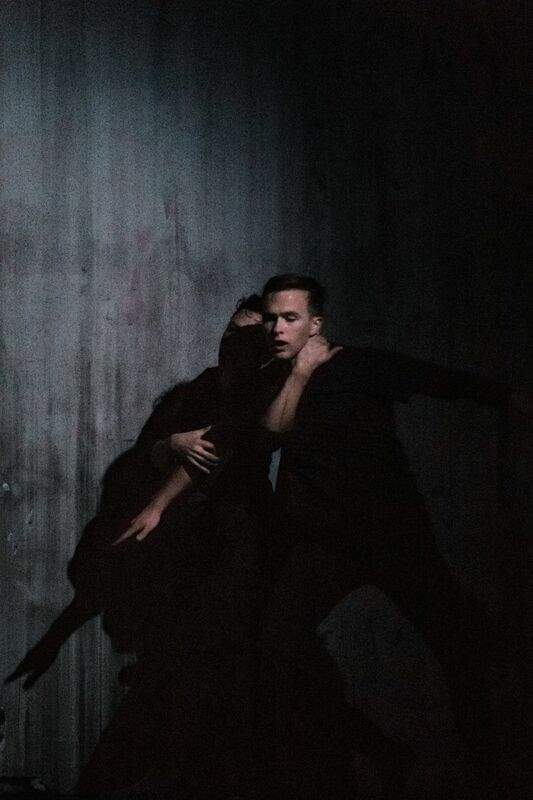 Whim W’Him’s core dancers are always solid, but here Karl Watson, Liane Aung and Cameron Birts were standouts — Birts in particular; he builds legible pathos and combustible energy in everything he does onstage. As for Wevers’ contribution, “Trail of Soles” combined signature elements I’ve come to expect from him: lightly sketched narrative, precise technique and unapologetically political undertones. Wevers is, after all, the choreographer behind last June’s “Silent Scream,” in which several performance tropes — especially those reinforcing normative gender norms — were handily subverted, while Charlie Chaplin’s anti-fascist speech from “The Great Dictator” played in the background. That kind of sound cue was critical, but the music seemed almost incidental in “Trail of Soles,” so compelling were the company’s fluid movements and subtle acting as they moved through warlike tableaux beside a line of empty shoes, the only set piece a tree of lights and wires suggestive of police states, borders and walls. “Trail of Soles” is about those things, and the separations they incur. 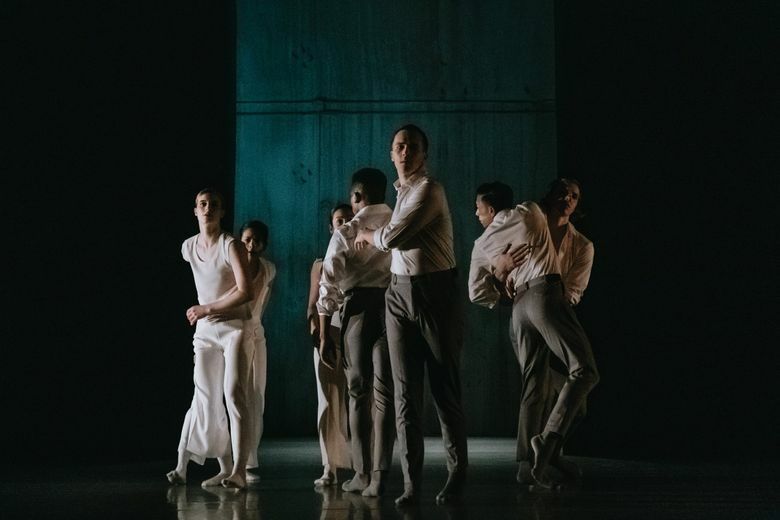 The piece oscillates between moments of despair and connection in carefully structured pas de deux and larger groupings. The gesture of two hands pulling away from each other arrives again and again, and each time it’s as heartbreaking as any of classical ballet’s wrenching moments of separation. When the dancers donned silver jackets reminiscent of the polyethylene sheets seen in images of detainees in intentionally cold detention centers, it felt surprising but inevitable — that’s where the piece had been going the entire time, hadn’t it? 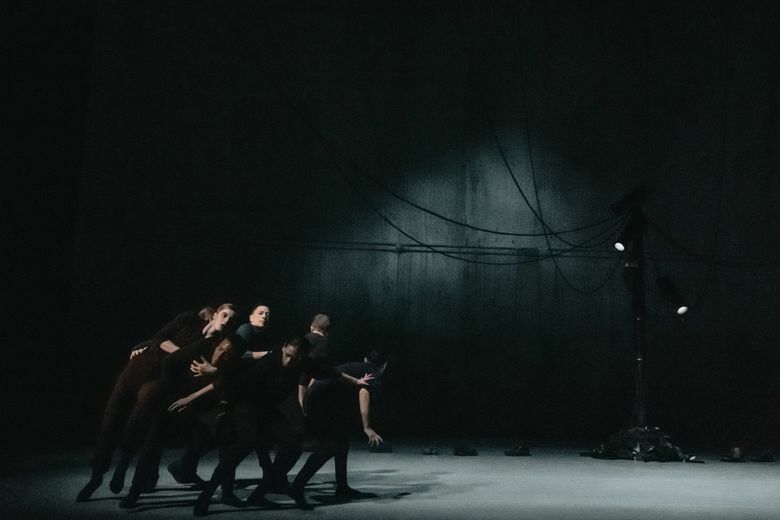 In narrative, partnering and style, “Silent Scream” and “Trail of Soles” are similar works — the latter feels in many ways like a continuation of that earlier performance — so I wasn’t surprised to find that Whim W’Him’s 2018-2019 season closer in June will be a full-length production from Wevers. Given the strength and thematic cohesion of his work this season, it will be interesting to see what he’s able to accomplish with a longer run time. Also worth checking out? Whatever comes next from Scofield and Yue.